Located above a downtown Saugatuck storefront, Mason Loft is a peaceful retreat in the midst of all the action. 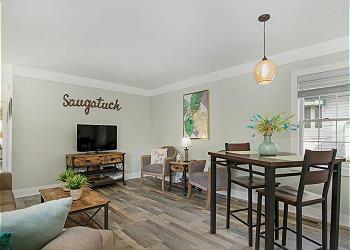 It's mere steps away from great shops and eateries of Saugatuck and boasts urban views, but its calm, sage tones and ridiculously comfy furnishings make it a relaxing place to rest your feet after a day of walking around town. Your dog is welcome to kick back in this apartment, too--it's dog friendly. Access Mason Loft from an alley off of Mason Street. The ground-level entryway is a perfect spot to keep bikes and strollers. Ascend the stairs to enter the apartment via the well stocked kitchen. Two can enjoy coffee at the kitchen breakfast bar, and there's dining for four in the open-concept living space. The calmly decorated living area has everything you need to kick back. Relax on the comfy couch and watch movies on the flat screen TV. The master bedroom offers a cozy king-size bed and plenty of natural light. The guest bedroom has a queen bed and small desk and chair! Make the most of downtown Saugatuck when you stay at Mason Loft. If a day at the beach is what you seek, popular Oval Beach and Douglas Beach are just a 5-minute car ride away.